Senior Management Team (SMT) of the Ministry of Commerce and Industry conducted its Quarterly Press Briefing on Friday 28, April 2017 in the Ministry of Commerce and Industry 4th Floor Conference Room from 2:00 – 4:00PM. Monrovia, Liberia - Hon. Axel M. Addy and members of the Senior Management team of the Ministry of Commerce and Industry on Friday, April 28 2017 conducted a press briefing to inform the general public on achievements and progress in accordance with the Ministry’s rebranding agenda. The briefing was headed by the Minister and Deputy Ministers who oversee the the four departments of the Ministries; Small Business Administration, Administration, Trade Services and Industry. Deputy Ministers Hon. Andrew Paygar (SBA), Hon. Frantz Sawyer (Administration), Hon. Stephen Marvie (Trade Services), and Hon. Roland Carey (Industry) supported by their respective assistant ministers and technicians who highlighted programs under their supervision and addressed issues within their departments. The Press briefing is part of the quarterly press briefing organized by Director Mitchell Jones to engage the public and provide a platform for journalists to have a dialogue on key issues of public concerns. This is a key commitment by the Senior Management Team in the implementation of the Ministry’s Strategic Plan, Rebranding Commerce. The general discussions will highlight the following within the respective departments. The Government of Liberia in partnership with the government of Japan has been undertaking a monetization program of two commodities, rice and petroleum since 2008. Products donated by the government of Japan are sold through contractual arrangement by a competitive bidding process. Private contractors who win bids to sell such products do so and make deposit into what is referred to as the Counterpart Value Fund at the Central Bank. The Ministry of Commerce serves as the Administrator of this process. Recently a new management guide was adopted for the improved administration of the program at the Joint Steering Committee, which comprised of government institutions and the Government of Japan representatives. The key elements of the new structures split the responsibility of management and oversight between several agencies. The Ministry of Finance is now the sole disbursing agent based on the approval of the Ministerial Steering Committee and the assessed and review of request by the Secretariat under the Ministry of Foreign Affairs. The Ministry of Commerce and Industry, like all other Ministry, will now report to the Chair of the Ministerial Steering Committee on a quarterly basis on its two projects, the Monetization and LIFE Fund Project. All staff of the new Secretariat will now be centralized at the Ministry of Foreign Affairs. The Ministry of Commerce and Industry sole responsibility is to report on a quarterly basis the performance of the LIFE Fund support for MSME Policy and the Monetization Program. This role is under the Department of Administration given its contractual oversight mandate. The Legal Office has been overseeing the merging of the two offices, the Industrial Property and Copyright offices in accordance with the new Intellectual Property Act for the promotion and protection of intellectual property rights. This will impact the creative arts and SME producers in the country. 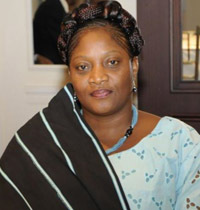 The Liberia Innovation Fund for Entrepreneurship (LIFE) is a private sector investment fund which focuses on developing and promoting innovations in the Liberian private sector by investing in capital infrastructure projects that promote the growth of SMEs and promote value addition within key industrial sectors as an implementation tool for the MSME Policy. The Government announced initial funding but due to budgetary challenges, funding was not made available through the National Budget. However, the Government of Japan to support the MSME Policy provided seed funding to commence LIFE Fund Innovation Projects. The Lofa Women Weaving Center (LWWC) was initiated in March 2014 out of the need to organize and train women in the Northern region of Liberia to produce high quality textiles from locally grown cotton and provide them gainful occupation that is critical for job creation and poverty reduction in that part of the country. Given the Ministry’s Launch of the Wear Your Pride Campaign announced in the President’s Annual Message in 2015, the demand for the Lofa Cloth has increased substantially. The Construction of the Center will enhance production to meet that demand while providing sustainable livelihoods for the many women who are active in that cotton industry. This project is a collaboration between the Department of Industry, RIPE Program (Rural Industrial Program for Economic Empowerment) and the Department of Small Business Administration market access implementation under the MSME Policy. The center is a weaving facility for weavers and designers of textiles and it is intended to promote, cottage industries and value addition of cotton in rural communities. The estimated cost is US$230,747.29, total expended cost to date, is US$161,523.11 and balance due to contractor is 69,224.18. The Project is expected to be delivered on schedule, no later than end July 2017. 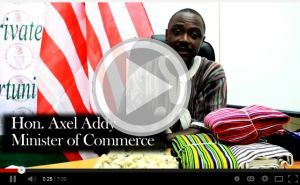 The Liberian Market Place-Trade Store was initiated in 2014 to show case Liberian made products. The Ministry of Commerce and Industry has currently expanded the existing “Liberian Marketplace” Trade Store to the newly renovated facility located on the top floor of the Nancy B. Doe, Jorkpen Town Market on 8th Street, Sinkor. The newly renovated facilitate will enhance market linkage and promote made in Liberia products from sectors like textile, manufacturing and food processing, arts and crafts, rubberwood, etc. The Economic Empowerment of Entrepreneurs (E+ Program) The Ministry of Commerce and Industry during its SBA 2015 MSME Conference launched the first phase of the E+ Program with support from the Government of Japan through its LIFE Fund and the International Finance Corporation. The project is intended to put life into 10 key sectors of the economy and to foster government inclusive growth agenda. Some of the sectors under the project are packaging, sausage production, fruit juice production, labeling, etc. The project is designed to promote and empower youth entrepreneurs through training and access to finance. The program also seeks to identify and promote the next generation of promising youth innovators with great ideas and solutions to real challenges in business and society. In 2016 the ministry signed an MoU with the Business Start-up Center (BSC), a local business development service provider for the selection and training of young entrepreneurs who make up the E+ First Class. BSC competitively selected ten young entrepreneurs through a business plan competition and trained them in small business development. US$100,000 has been expended as seed funding from the LIFE Fund for to the ten entrepreneurs. To date, BSC has disbursed US$80,000 to eight of the ten entrepreneurs who have met all the requirements. The eight beneficiaries are as follows: Michaels’s Engraving, Witness Multimedia Service, Edutainment Playground Center, G.G. God Fearing Business Center, Gee-K Packaging Business, Family Group of Companies, Zoqueh Naturals, Samatta God’s Favor Business center. Liberia Marketing Association Red Light Rice Depot. 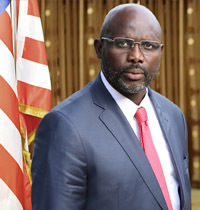 The Ministry in 2016 signed an MoU with the Liberia Marketing Association (LMA) for the use of the top floor of the Jorkpen Town Market to host the Liberian Market Place. Under the MoU, the Ministry is expected to pay LMA US$50,000. This amount is used to construct a Rice Depot that will sell rice at wholesale price to marketers in the Redlight. To date, US$25,000 has been disbursed to LMA from LIFE Fund. Project is 40% complete. Balance expected to be paid upon receipt of project progress report. The Ministry in 2016 signed a MoU with the UNDP to build a SBA/BOSS Center within the SBA to provide business development services to the MSME sector and procure needed furniture and equipment to effectively run the center. The project is estimated at a little over US$400K over a three-year period. The Procurement process is in an advance stage and work is expected to begin in May. To date, No money has been disbursed by UNDP to any contractors to commence the renovation work for the setting up of the Boss Center. The Ministry of Commerce in partnership with WTO/EIF and the Government of Japan through the LIFE Fund, UNDP and USAID/LADA has expanded on the Liberian Marketplace Trade Store to the Liberian Marketplace and Farmers’ Market at Nancy Doe Jorkpentown Market in Sinkor. The Farmers’ Market is organized by the Small Business Administration with support from the Department of Trade Services. This is a linkage initiative that brings the harvested farmer’s produce to the market and brings the supermarkets, restaurant and hotel buyers to that market every 2nd and Last Saturday of every month. This Saturday will be the Farmer’s market. Constructions are currently undergoing for 2 new factories in the park. A key component of the Ministry Strategic Plan, Rebranding Commerce, is the inspection reforms procedures. The Ministry now conduct inspections in a professional and systematic way and as such inspections are announced on a quarterly basis. MOCI has currently commenced the process of the quarterly inspections for the next four weeks. On April 13, 2017, the Ministry in collaboration with the West African Quality System Program launched the National and ECOWAS Quality Awards for 2017. The National and ECOWAS Quality Awards are designed as interventions in addressing the lack of quality in products and services as a major constraint to the participation of member states in the global trading system. It will foster a quality culture among manufacturer/producers within the region. Transformation of Customs Procedures into a Single Window Platform to improve import/export procedures. Pass or adopt a number of key legislation including the Customs Code, the Intellectual Property Act, the Competition Law, the Foreign Trade Law and the Adoption of the ECOWAS Trade Liberalization Scheme and the ECOWAS Common External Tariff. Putting in place regimes of Sanitary and Phytosanitary (SPS) and Technical Barriers to Trade (TBT), etc. 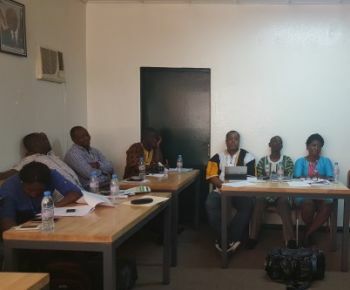 The Ministry is working with Liberian companies to facilitate the process of getting approval through the ETLS National Approval Committee to export to other ECOWAS countries. This effort comes after Minister Addy led a delegation of Liberian agriculture concessionaires to Accra, Ghana to discuss with their Ghanaian counterparts and explore new markets. The Ministry as Chair of the Inter-ministerial Concession Committee (IMCC) is working with the National Investment Commission for the contracting for the National Single Window and Verification of Conformity (VOC). The Single Window will eradicate the Import and Export Permit Declaration and the VOC will address standards and quality. The Ministry is working with MFDP and LRA to ensure that the Customs Code is passed as the passage of the Code will transform trade facilitation, promote transparency and adjust trade transactions/behavior in inspection and valuation. MoCI worked with IFC to facilitate a series of Business Roundtables with the business community in 2016. MoCI assumed the chairmanship of the Business Reform Committee (BRC) and has met with the private sector to update them on the progress being made on the business climate indicators. Work is underway that will impact the World Bank Doing Indicators. These indicators are typically a diagnostic of what challenges businesses are facing. As Chair of the BRC, that Ministry is coordinating activities with other agencies to improve on the key indicators. Key indicators include: Starting a Business, Getting Credit, Paying Taxes, Solving Insolvency, Dealing with Construction Permits, Getting Electricity, Trading Across Borders, Business Inspection, Visa/Work Permit/Residency, Vendor Registration, and Publication of GoL Fees. An action plan has been developed to monitor progress on the indicators. Respondents (28 persons) will be contacted next week. The BRC will meet with the respondents to provide updates on the indicators. The Ministry, as per its mandate, ensure the steady supply and quality of, and stability in the prices of essential commodities (rice, cement, petroleum products). The Ministry has put in place a Bulk Commodity Committee approval process to ensure that approval of documents are informed by data and market intelligence to protect consumer and ensure quality supply. To support the decision in the Bulk Commodity Committee meetings, the Ministry published the Annual Trade Bulletin, Commerce Today, a Monthly Critical Commodities Bulletin and a Weekly Market Report to monitor bulk products. The Ministry is in the process of finalizing the Business Handbook, which details procedures for doing business, trading, acquiring work and labor permits, as well as other relevant information for investors. Information gathered through LISGIS and published Commodity Indices to monitor price fluctuations across the country. However, lack of adequate data has impacted the regular publication of updated Commodity Indices.